Bernanke says the House highway bill is using sleight-of-hand maneuvers that uses the Fed to fund highway construction. Former Fed Chairman Ben Bernanke. 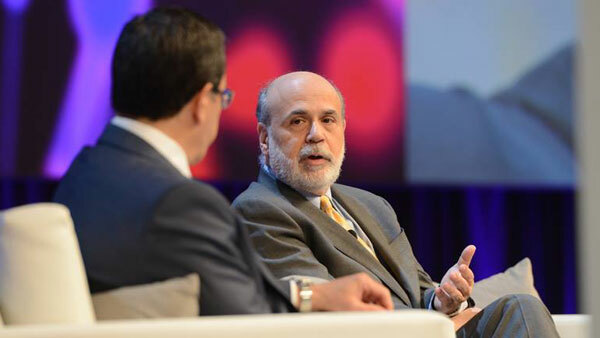 In his latest blog, Bernanke explains why the House plan is not on the up-and-up. The Fed regularly transfers all the interest it earns on its portfolio of securities, minus operating expenses and interest paid on liabilities, to the Treasury, says Bernanke. And the numbers are huge: nearly $500 billion over the past six years, which is applied to the budget deficit, easing the burden on taxpayers. The Fed’s capital account, now at $29.3 billion, acts as a buffer to absorb any losses on the Fed’s portfolio and smooth over payments to the Treasury. Therefore, drawing on the Fed’s capital account does not increase revenues for the government because the money would have gone to the Treasury anyway, writes Bernanke, noting that it could, however, increase budget deficits. This strategy could increase revenues only if Congress required the Fed to reduce its capital, writes Bernanke. In that case the Fed would need to sell some of the government debt it owns and give the proceeds to the Treasury. But then, writes Bernanke, the Treasury would no longer collect interest on those securities –- interest that would have previously gone to the Treasury. Bernanke calls on “legislators who care about the integrity of the budgeting process” to withhold support of the House bill. In contrast, Rep. Paul Ryan (R-Wis.), the new speaker of the House, hailed passage of the House transportation bill, by a vote of 363 to 64 after consideration of 130 amendments, as a major achievement. “This has been a great week in the people’s House,” said Ryan. In the past the federal highway bill was supported entirely by the gasoline tax but that’s no longer the case today. That tax has been stuck at 18.4 cents a gallon since 1993, which is equivalent to 30 cents a gallon today, according to the Bureau of Labor Statistics inflation calculator.